What's New and Different This Year? 1. We’re happy to announce that we have booked this years Something Personal Exhibition at the spectacular SOMARTS BAY GALLERY in San Francisco, which is considerably larger than last years venue. 2. The Exhibition Holiday Party is on a Monday instead of Sunday and it's a week earlier in December this year, so it will be even more fun for more people. 3. The carefully refined Entry upload and secure checkout system is built right into the APA National website, so all APA members can simply login to upload their entries, and non-members can easily register and upload their entries. 1. Our 20th annual impressive juried, framed Personal Work Photo Exhibition. 2. Nearly one thousand Creatives, Photographers, and others are expected to attend the spectacular annual Gallery Exhibition & Holiday Party. 3. APA Members get up to a full 50% discount on the Entry fee. 4. Acclaimed Panel of Judges (listed below) will see your work, at their own pace. 5. After the blind (no names visible) judging is over, judges can find out who created their favorite entries. 6. Online Gallery version of the Exhibit will be up for all of 2018 and beyond, (last year's gallery is here). 7. This year, again twice as many images will appear in the online gallery. 8. Top place images proactively promoted to 2000 Creatives via email. 9. Best of Show image appears on special Announcement and Poster. 10. Prestigious Exhibition of 100 images helps all Exhibitors succeed. 11. Simple, reliable, secure online entry procedure, through the APA National website. 12. No limit to the number of images you can enter. 14. Fairness Max6 Rule: no one can get more than 6 images accepted into the show. 15. Excellent odds of getting images accepted into the Exhibit. 16. We featured 69 different Exhibitors’ images last year. 17. About 1/4 of all entrants got at least one image in the 2016 Exhibition. 19. High quality frames at a significant non-profit discount. 20. After the show, the framed prints are yours to keep and hang, or to give as holiday gifts. 21. Superb opportunity to advance your career, display your own photographic style. 22. Exhibitors have special name badges at the Opening Night Party so new clients can network with you. 23. Exhibitors have the most fun at the elegant Exhibition Holiday Party! 24. Top Exhibitors receive Award banners for their websites, and under their framed images at the Opening. 25. 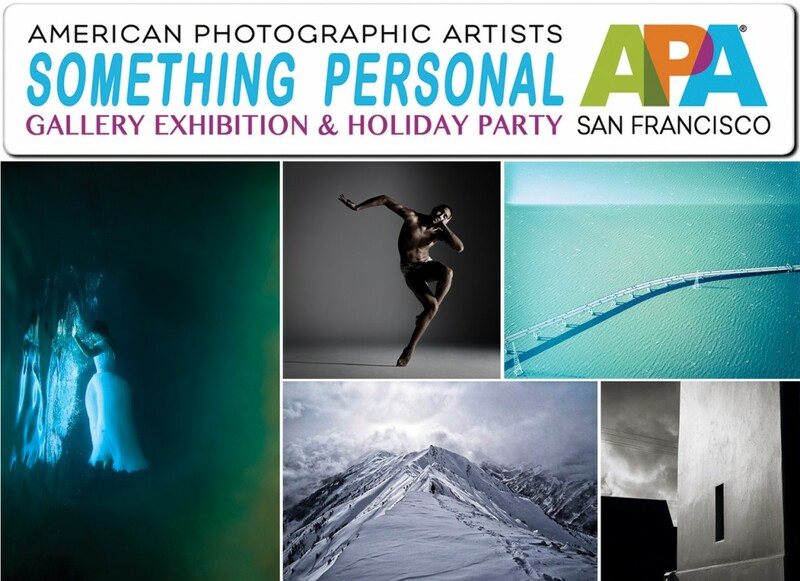 APA Something Personal Exhibit is one of the world’s most respected and prestigious photo contests. 26. Exhibitors (+ ltd number of their guests) are guaranteed admission to the exclusive Opening Night Party. 27. Many Exhibitors sell their framed prints after the show. 28. Exhibitors' websites get a good boost in online traffic, especially from Creatives. READY TO ENTER? PLEASE CLICK HERE. 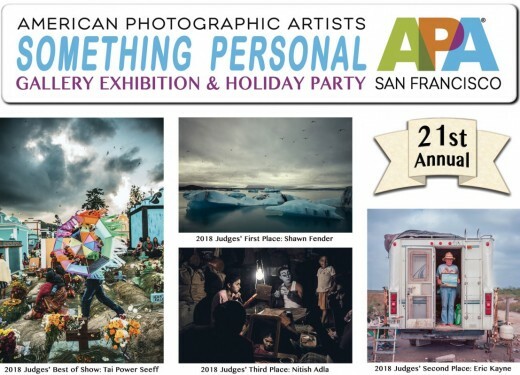 APA San Francisco's annual Something Personal Exhibition is well established as the photo event of the year in our region. Something Personal 2017 is a great opportunity to exhibit your finest framed personal work at the spectacular SOMARTS Bay Gallery in San Francisco, at a huge, Exhibition Holiday Party, from 5:00-11:00 PM on Monday, December 11, 2017. Every recent year, between 600 and 1000 people have attended the Something Personal Exhibition Holiday Party. All of the top Creatives and Photo Art Galleries in our region will receive special invitations, so this is a superb opportunity to show them your finest personal work, and meet with many of them. We will also display the complete exhibition on our website for over a full year, so your finest personal work will be available to thousands more clients. We've chosen a large and wonderfully popular venue that will easily accommodate 100 framed prints, so your chances of participating in the APA SF 2017 Something Personal Exhibit are truly excellent! You can online-enter as many JPEG images as you like. We've limited the number of accepted pieces from any one photographer to their top six, as decided by the Judges' scores. Creatives love to see pro photographers' personal work, because it reveals your true photographic style, without anyone else's influence or input. The APA SF Something Personal Exhibit started two decades ago with this core concept, and each time, we've streamlined the process to make it even easier to enter, with very few restrictions. This year, we again have easy online entry and judging. • No series of images. • No creation date restrictions; no limitation on when your images were created. • No vastly different size prints or frames. • Only strong, original, creative, truly personal work gets accepted. • Entries may be black and white, duotone, or color, and should be self-commissioned. • Entries must represent what you consider to be your finest personal work. • Alternative print processes (tin type, etc) are acceptable (framing will cost more). • Diptychs & triptychs can be entered, and will be judged, displayed as a single image. • All images must be displayed in the standard 16" x 20" frame size, including diptychs, triptychs, and panorama images. Square images can be displayed in 16” x 16” frames. No commercial work, please: Images specifically commissioned for publication, or some other use by a paying client are not considered true "personal work" for the purposes of this competition and may be disqualified without prior notification or explanation. Each of whom are directly responsible for hiring photographers or buying pro photographers' imagery. A list of past years Judges is here. APA members save up to 50% on each entry. There are different Entry Fees for different APA Member levels this year. Not an APA member? Now is a great time to join APA and receive up to a 50% discount on each image you enter. Current APA member looking to upgrade your membership? Please read the basic Upgrade info here, then please contact: members@apanational.org. Please read the Competition Rules (below), and then follow these guidelines and image requirements carefully to ensure the proper submission of your entries. • APA Members simply login to their APA Profile to automatically receive the appropriate discounted entry fee. • Non-members can enter images into the contest by creating a guest account with business name, email address and password. • A single image entry is one image. (Diptychs & triptychs can be entered, and will be judged and displayed as a single image). • You can upload as many images as you would like during the process. • Image files need no unique title by the entrant; they are assigned an arbitrary ID for "blind" judging. • All files must be jpgs, no smaller than 800 pixels on the longest side, and at most 1280 pixels, 72 ppi, sRGB color profile, with no visible identifying text/symbols. • All files must be jpgs with a file size limit of 10mb. • Please do not submit larger files. Entering images over the size limit will not increase your chances of winning because all entries will be displayed at the same screen size for the Judges. Oversize images also risk overloading the submission system. You can enter as many images as you like, but we suggest limiting the total to 8 images per upload. • You'll see a preview of your images. Preview your submission. • Once you have paid, your submission is final and you will not be able to edit your images. • You can return to your account to enter more images. Everyone who enters will be notified of their entry status one way or the other, on or before November 13, 2017. APA SF never leaves you wondering; we know you want to know. Decisions of the judges shall be final and binding. All of the final accepted print exhibition entries (as determined by our judges) must be printed as high quality single image prints, and must be window mat mounted on white, or off-white mat board with outer mat dimensions of 16 x 20 only. Floating mats are acceptable and available from the framer for an additional fee. Matless, full frame images are also acceptable. Square images can be displayed in 16" x 16" square frames, or in the standard 16" x 20" frame only. Be sure to clearly print your last name on the back of the mat, and also on the mat back write "TOP" on the top for frame orientation. You will have about 2 weeks to print and mat your images, and ship or drop them off at the framer. Your images will be custom framed under glass in a very high quality Black Matte Finished Studio Stem Molding Wood Frame by Michael Thompson Framing. Drop off your matted prints directly at the framer BEFORE November 27, 2017. We again negotiated a non-profit volume discount so Framing Fees (including sales tax) are still just $57 for each 16 x 20 frame, which are due by November 20, 2017 (MAIL IT TO THE APA; PLEASE MAKE YOUR FRAME FEE CHECK OUT TO APA SF; You can also pay through EventBrite for a nominal extra fee). There is no APA frame mark up, no hanging fees, and the framed piece is yours to keep. Please plan on picking up your framed print at the very end of the December 11th Exhibition Holiday Party. The pick up times for any framed pieces not taken home on December 11th will be emailed to Exhibitors after the event. Any pieces not picked up by the final pick up deadline will be recycled. SHIPPING FRAMED PRINTS : This year we are again accepting entries from all photographers, no matter where you live. If you, or someone you trust are unable to attend the Opening and take your framed print(s) home at the end of the event, and would like it shipped to you, please note that you will need to provide, in advance: a Fedex Air or Ground account number and a $30 check for the packaging and handling fee for each framed print. (If you don't have the framer use plexi, the glass must be removed from framed artwork before it can be shipped—just your print and frame will be sent, no glass will be shipped). We will follow up with you after the December 11th event with complete details. (i) Warrant to APA SF that they have created and own the work submitted (including all elements of the work) and that nothing within any work has been copied or added from another person's work. (ii) Warrant that the whole copyright and any other form of intellectual property right in the work is vested in them. (iii) Warrant that they have not in any way assigned, licensed, disposed of, or otherwise encumbered any of their rights which allow them to deal freely with the work and the copyright therein. (iv) Warrant that they have obtained model or property releases from any persons and/or property owners requiring such, featured in their submitted photographs allowing publication in any and all media forms. 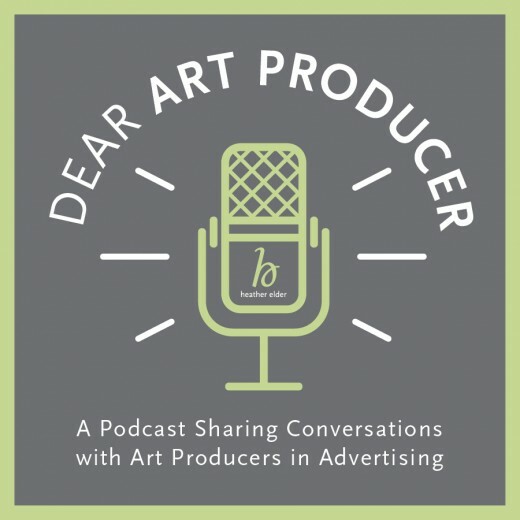 (v) Agree that their work may be exhibited or shown during APA sponsored events, as well as on the APA websites and APA promotional materials, allowing for the photographer to retain complete control over the licensing and sale of their work. (vi) Agree that APA may reproduce and may allow reproduction of winning images in APA approved publications. Credit will be given to the photographer for any image(s) used. (vii) Acknowledge that APA relies fully upon the warranties and license given by Entrants when submitting their entries for consideration to The APA Something Personal 2017 Photo Competition. Entrants indemnify and hold APA harmless from any claims, actions, proceedings, costs and expenses arising as a result of any allegation that the relevant Entrant did not own or is not wholly entitled and authorized to allow publication and reproduction of the work by APA. (viii) APA SF reserves the right to disqualify any winner not providing the required personal information and winning image in the requested file format and size within two weeks of APA SF's request via the contact information supplied by the entrant. Replacement winners will be selected at the judges’ discretion. (ix) Judging is a blind process. Photographer's names will only be disclosed to the jurors after the judging process has been completed. The decision of the judges of the competition shall be final and binding. (x) Entrants retain full copyright to their images and grant no usage to APA SF other than those granted herein. APA SF, the Sponsors, or Venues showing an exhibition of winners shall not be liable for any loss or damage of any entry. Submission of an entry to the competition automatically constitutes the contestant's acceptance of all conditions set forth in the above rules. It also acknowledges the right of APA SF to use the photographer's likeness and information, as well as the winning images, in exhibitions and promotions, in any and all forms of print, electronic and digital media, related to APA Something Personal Photo Competitions for up to 48 months following the 2017 Competition winner's announcement. (xi) Final Deadline for entries is Midnight on the West Coast, October 26, 2017. Entry fees cannot be refunded, once submitted. (xii) Winners will notified before November 13, 2017, and officially announced at the Exhibition Opening Night. (xiii) All images must be displayed in the standard 16" x 20" frame size, including panorama images. All diptychs and triptychs must be entered together as one jpg, and must be displayed together in one 16" x 20" frame. Square images can be displayed in 16" x 16" square frames, or the standard 16" x 20" frame only. (xiiii) Images specifically commissioned for publication, or some other use by a paying client are not considered true "personal work" for the purposes of this competition and may be disqualified without prior notification or explanation.